Yesterday at the Treadle Tuesday meeting of Fashion Sewing Club everyone got their money’s worth-well, that is judging by the buzz created by Cathy’s shrug. Evidently some of you have seen it before way back at Stretch and Sew but the popularity demands that we remind you or show you for the first time. The shrug shown here is in a wispy wool knit from Treadle. Cathy’s bag of goodies, however, showed many other possibilities for the shrug-double faced knits, silks, single knits, the options are endless. Cathy likes to keep at least one of hers wadded up in the car so that she always has something to throw on as needed. Debbie and I were so inspired that we splurged and bought the paisley Liberty of London wool to split down the middle and we’ll each have one. Directions: Cut a rectangle of fabric 2 yds. by 20″. Fold in half so it measures 1 yd. by 20″. Beginning at folded end, leave a 15″ opening and then stitch together to the end. Hem edges or not as you see fit. Great dress for fall, teaching, shopping, etc. Nice work, Barb. 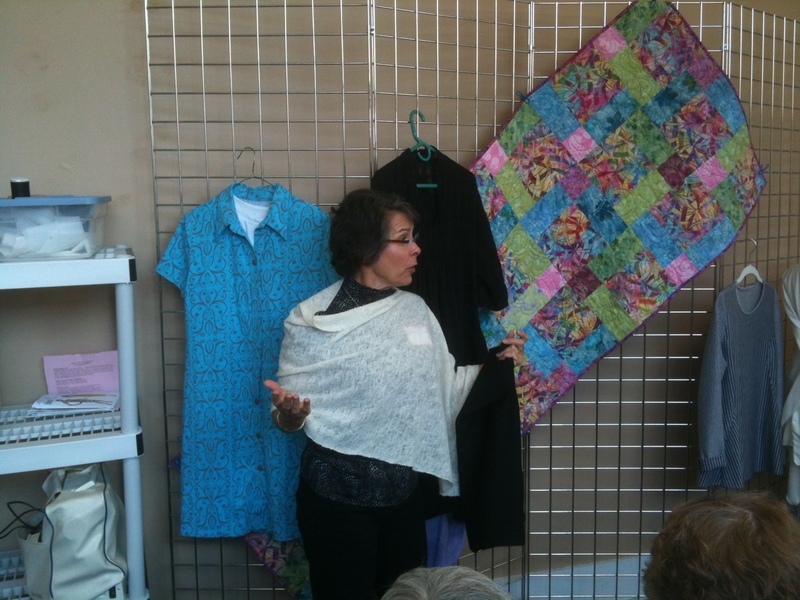 Su Tucker had her first trunk show run at Make It Sew last week. She had made more great dresses for little girls. The appliqued faces and legs (so cute) that we saw at Treadle last month are available in pattern form now. I can put you in touch with her if you are interested in purchasing them. You have one more chance to see Su and her trunk show, Saturday, Oct. 13, at 2 pm. Registration required-don’t miss it! And one last item-if you are tired of seeing teenagers modeling the latest fashions, try these blogs for a refreshing perspective-Advanced Style (Sartorialist for the mature woman), The Women’s Room (“on line community created for 35 plus freethinking, intelligent, stylish women”) and That’s Not My Age.